It really can be frustrating having a large and heavy vacuum cleaner to lug upstairs and get around the house. Just about the only thing it’s good for is developing your muscles. That is why many people are turning to light weight and flexible stick vacuums that are more able to get to the deeper recesses of your living room, under the coach, or in a much easier way. Let’s compare two of the best stick vacuums on the market, the Ergorapido and the LiNX. From Electrolux the Ergorapido is available for a around $155 so a little less than a LiNX at around $160. 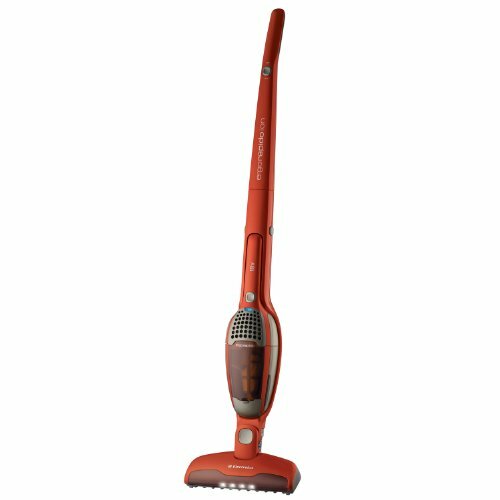 It has a hand vacuum cleaner that is detachable and is really easy to use. Getting the hand vacuum off only takes one press of a button and gives you flexibility in your cleaning, using the hand vacuum part for cleaning upholstery or drapes, even for the stairs, where a stick vacuum can be very awkward to use. The swivel head can go through 180 degrees which makes it great for getting around corners and is a very nice design. There is a dusting brush and crevice tool to help with the non hovering activities and you have 30 minutes to hoover before you have to recharge. This is pretty good compared to many of the alternatives on the market. It uses an 18V lithium ion battery much like many of the counterparts in the industry although you’ll find the Dyson DC35 Digital Slim has a 22.2V battery. The vacuumed up materials can be simply disposed off without any bags and with minimal fuss. On top of all these features, you get a 2-year warranty from the manufacturer demonstrating that they are pretty confident the product is going to last. The weight of the stick vacuum cleaner is just 5.1lbs. That’s pretty incredible and extremely manoeuvrable, even for the smallest of us. The hover LiNX is totally different from the Ergorapido. It doesn’t have as many additional features as you’ll find on the Ergorapido or even some of the Dysons. It’s basically a cordless vacuum for pushing around and is twice the weight of the Electrolux machine. You don’t have additional hand hoovers or any fills to speak of. It is a good bit more expensive than the Ergorapido coming in normally at around $150. It’s a good hoover for both carpet and wood floors and you can recline the handle in order to get under furniture and beds without any issues whatsoever. On the stairs it has an excellent swivel head and makes the job easier than most stick vacuums. Unfortunately the battery only lasts around 15 minutes which if you live in a larger home or have a bigger space to hover maybe an issue. It doesn’t require a docking station as it can stand up on its own and you can just pop it in the corner because it is very small dimensionally. As we’ve seen the LiNX has an excellent swivel head that’s great for the stairs. You also have bagless emptying and an 18V lithium battery as we find on the Ergorapido. The batteries are also removable so you can get an additional battery if you want to extend the time of operation to 30 minutes. As with the Ergorapido, you get a 2-year warranty. The LiNX is heavier at 10.2lbs but is still extremely light weight and handy as a hover. Both vacuum cleaners are excellent additions to the consumer market. They retail at significantly lower prices than comparable models and do a great job. If you want that bit of extra time to do the vacuuming, then the Ergorapido is probably the way forward. If you hate doing the stairs, then the LiNX may be a better option for you. You really can’t go wrong if you’re looking for a stick vacuum cleaner with either of these alternatives. If we had to choose one of these machines it would be the Electrolux Ergorapido because of its low weight and separable hand-held cleaner. The fact that it lasts twice as long as the Hoover LiNX is also important. But please do let me know which one you have opted for and why in the comments below and why & if you have any questions, comments or remarks regarding either the comparison article of 'Linx Vs Ergorapido' or about either of the models specifically (e.g. the Linx's mechanical specifications & features) then please do not hesitate to make them in the comments section below also and I will be sure to get back to you as soon as possible.